Coach Adam Gase says Tannehill resumed throwing Sunday and felt good. Gase says if Tannehill can get through this week with his shoulder feeling good every day, there's a chance he could play at Indy. 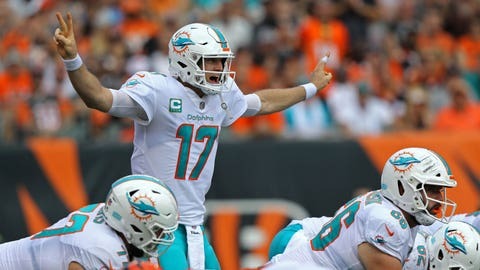 DAVIE, Fla. (AP) — Miami Dolphins quarterback Ryan Tannehill has begun his latest throwing program with the goal of returning for the next game Nov. 25 at Indianapolis, although that may be a long shot. Tannehill was shut down after an earlier throwing program produced little progress. He missed his fifth game in a row Sunday when the Dolphins lost at Green Bay. Coach Adam Gase says Tannehill resumed throwing Sunday and felt good. Gase says if Tannehill can get through this week with his shoulder feeling good every day, there’s a chance he could play at Indy. The Dolphins have a bye this week. Brock Osweiler is 2-3 as Tannehill’s replacement.